With Topics Google gives one smart solution that takes 5 clicks, bundled for the users on the platform. It is a high quality stream of information and direct channels to productive communication. Topics smart solution takes 5 clicks. While companies thrive to reorganise assets, cloud based solutions and inside project based career to employee, their potential clients just got immediately knowledgeable with Topics. On the other hand companies can freely access Topics to research data live online, while on the go. It takes 5 clicks. Here is an example. The Collections users follow and the Communities they join are live online interaction on channels of communication. It is up to user’s skilled navigation on the platform Google Plus to implement the workflow for efficiency and productivity, if this is what they are aiming for. 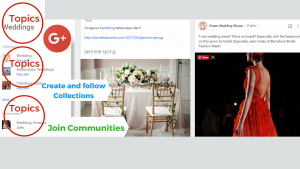 Spaces as Google Create, Google Collections Community, Arts, Photography Programs, Fitness, Crafts and many more programs online are educational and entertaining. 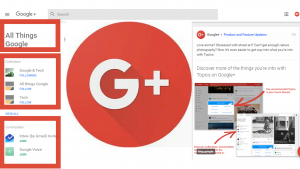 With Topics, Google Plus platform has all the variety of a fulfilling daily experience. Why is this important? Bill Slawski informs about Google’s new patent and adds expert SEO insights : Will Google Start Giving People Social Media Influencer Scores?